Wrapping up his day of work in his study. Hu-Dad discovered an office security alert had been declared due to a passing threat. 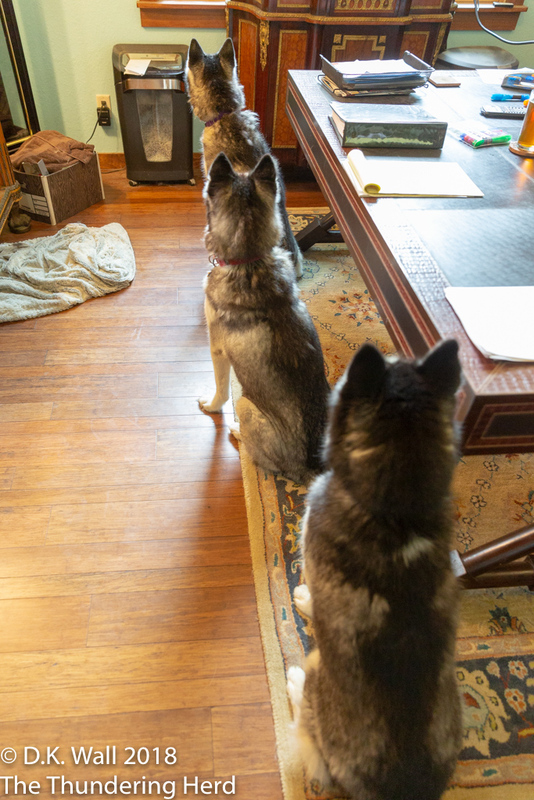 The boys – Frankie, Typhoon, and Landon – lined up for an office security alert. As we have explained before, we live at the end of a gravel road which connects to another gravel road that goes through the ranch next door. The only place the road in front of our house goes is back onto the ranch property. This is a nice way to explain that we don’t get traffic in front of our house. We can go days – even weeks – without anyone passing by. Hu-Dad’s first suspicion was that horse back riders were going by, but nope. First, with the above photograph, we can prove that our Hu-Dad colors for a living. Oh, sure, he claims that he was highlighting issues in that giant black notebook which he claims is a novel he is writing, but it looks like a giant coloring book to us. Besides, how many colors do you need to highlight “issues?” And that adult beverage on his desk belies any suggestion that he is working, even though these photos were taken around 7 pm. 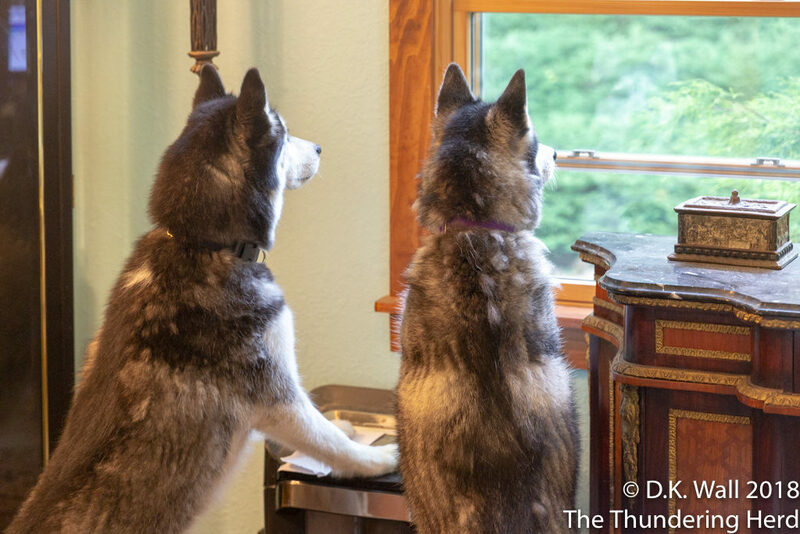 So what is so interesting out there? But back to us and our intruder, the much more interesting things in the study. What threat had our attention? Pardon the grainy surveillance photo, but we were being invaded by humans and two golden dogs walking the horse trail in front of our house! Oh wow-I LOVE todays photos and storyline! 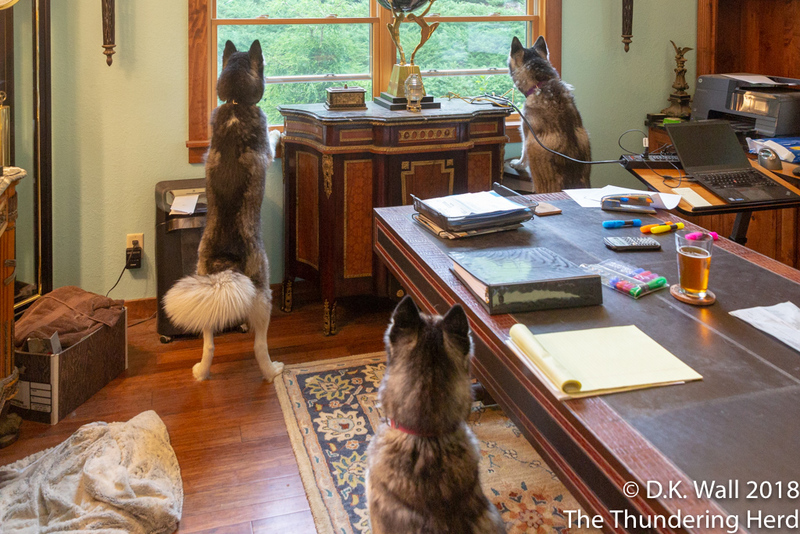 “How DARE those humans and golden dogs invade our property?”-too funny but glad you have a built in security system!! Looks like silent alarm was engaged? Mine barks at leaves clouds ducks. Shepherd trapped in a Corgi body is rough!! Wow! Great alarm/alert system! You Sibes are the best! LOVE seeing your photos and comments – thanks for sharing!